Portugal’s Moorish influence has lent itself to tile design, the culinary arts, architecture, and, in the case of Alfama and Mouraria, city planning with labyrinth-like travessas, escadas, and calçadas, open squares, narrow residential alleyways, and cobbled cul-de-sacs. This romantic side of Portugal fanned the flame of visiting artist Cale Atkinson’s imagination and resulted in something truly spectacular for the child (or romantic) in all of us. 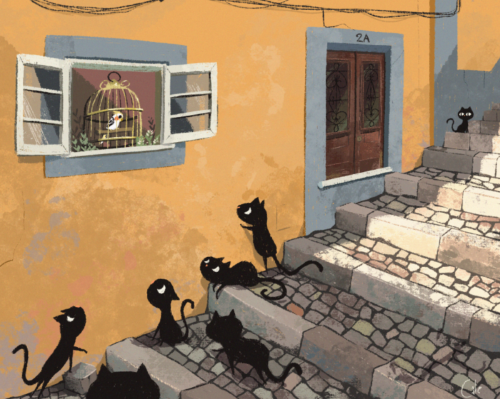 Atkinson is an artist, author, and animator from Kelowna, British Columbia, who’s spent 15 years working in animation, video games, magazines, comics, and picture books. He claims to “believe in tea more than sleep,” which becomes apparent when you see the incredible scope and quality of work he has done for big names like Penguin, Disney Hyperion, Marvel, Scholastic, Simon & Schuster, and many more. 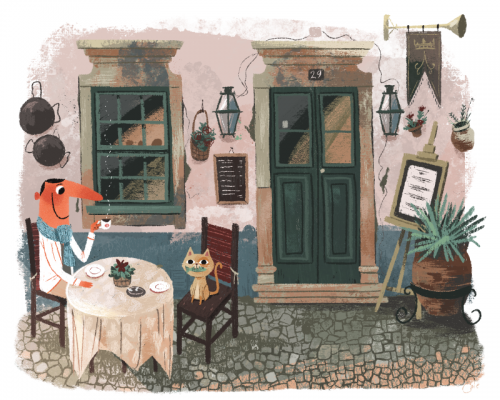 But Atkinson’s travels through Portugal prompted him to sit and sketch for no one but himself. When we came across his stuff, we couldn’t let him keep it a secret, so we decided to get in touch. Tell me a little bit about where and how long you stayed when you came to Lisbon. My wife Jessika and I came to Lisbon this past February for the entire month. We decided to escape the grey, cold winter back home in Canada and spent three months total in Portugal (one month in Lagos/Algarve, one month Lisbon, and one month Porto). While in Lisbon, we stayed in the top suite of a lovely old building in the Graça area. Did you extend your trip to be here that long or was that always the plan? 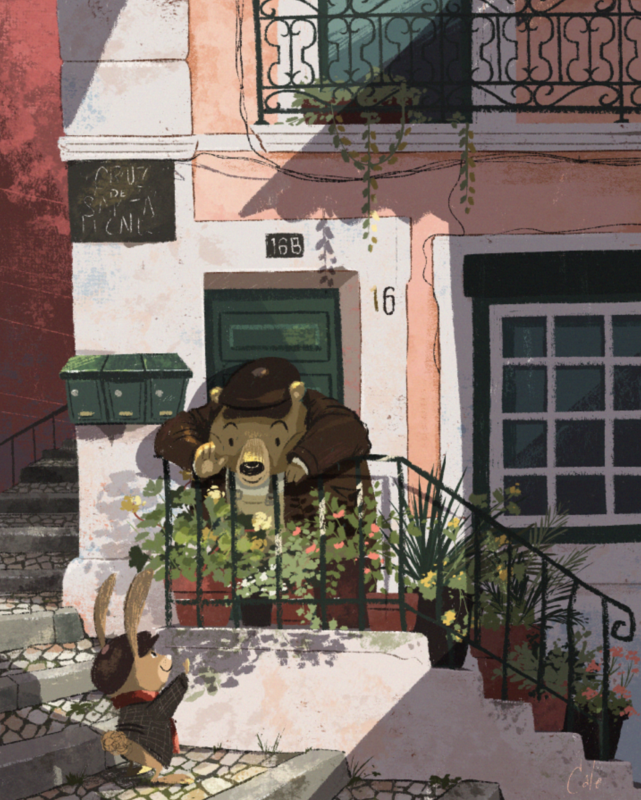 It was always our plan to stay at least a full month in Lisbon, although we surely could have stayed longer, as we both fell in love with the city and found it very easy to live and settle in. We may be returning this coming year for another Canada winter escape! 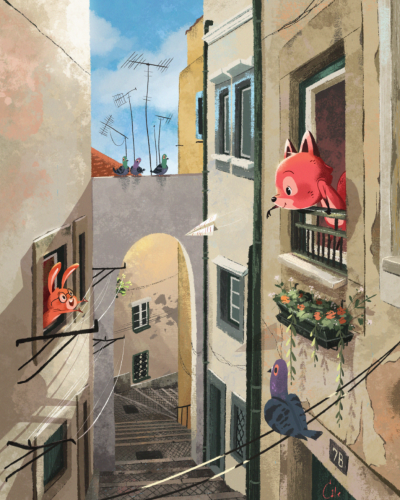 What was the first piece you did that was inspired by Lisboa? 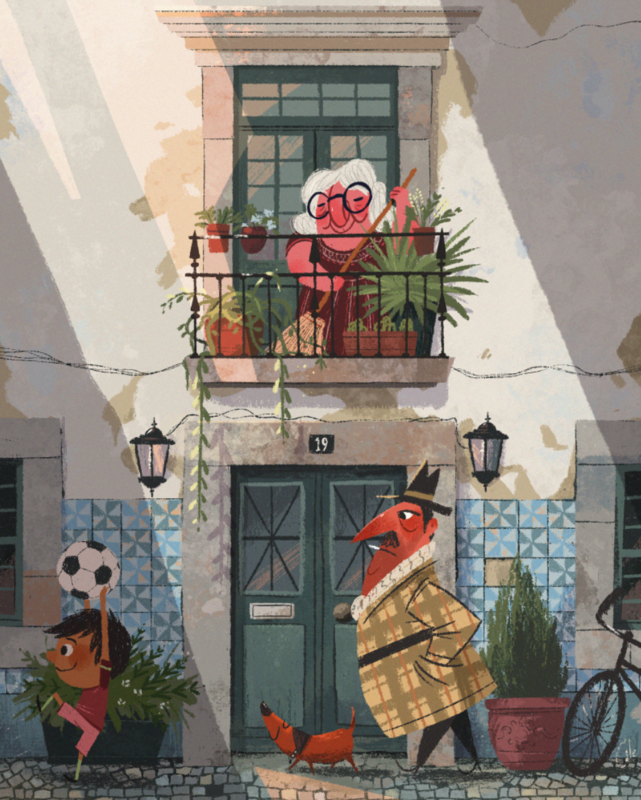 I began my Portugal-inspired art pieces while we were traveling the Algarve region. My first piece once in Lisbon was the one with an old man painter sitting in an Alfama alleyway. While he was something I made up, the surroundings were taken from reference photos I took while wandering the streets. What made you decide to make a series? 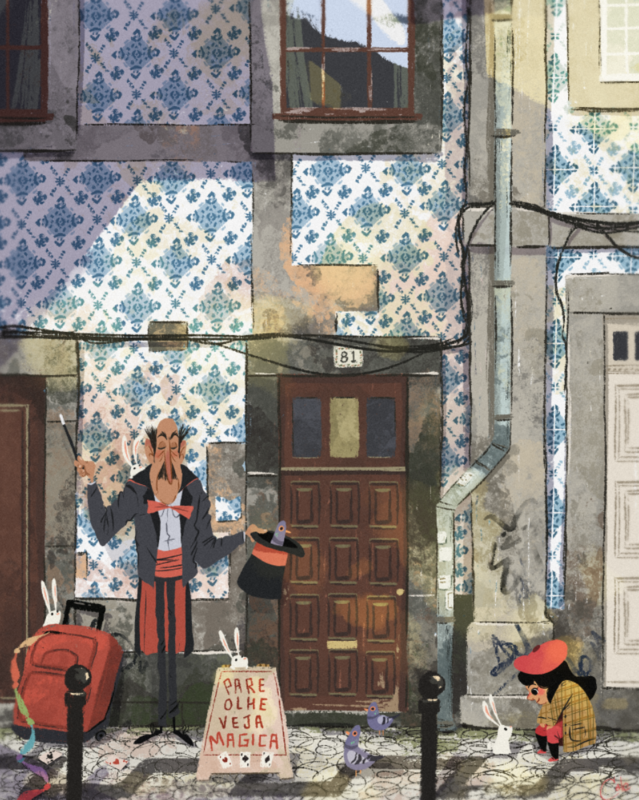 I really fell in love with the character, colors, and tiles of Lisbon, and moreover, Portugal as a whole. I honestly couldn’t stop at just one, or two! I just wanted to keep painting more and more. 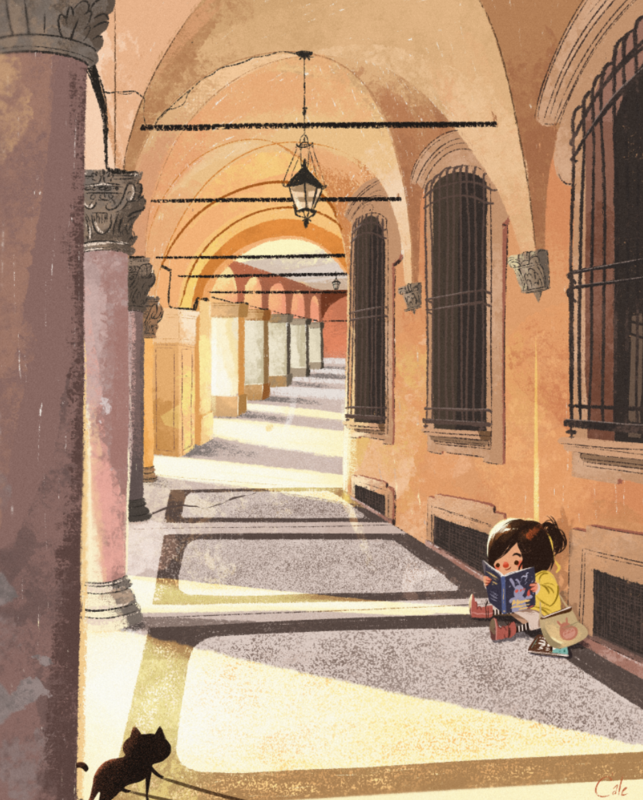 Luckily, at the time my picture book deadlines were on hold, so I had the free time to take advantage of the inspiration. Is there anything that felt familiar to you, seeing as how you’re from Canada? While Lisbon visually looks much different than most of the cities here in Canada, I did find the people we encountered to be as friendly as back home. We always felt welcome and met many wonderful people during our time in Lisbon. 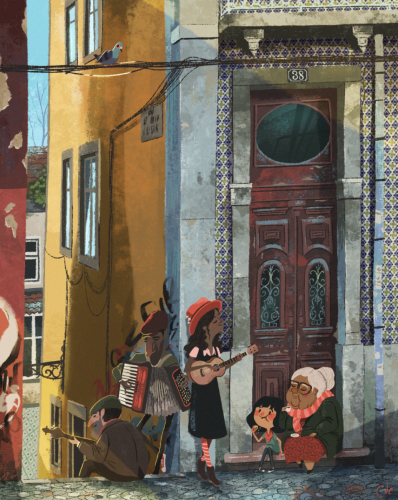 It can be hard feeling at home in a different or foreign city, but from the moment we got in, Lisbon opened its arms to us. What was your favorite thing to do or see in LX while you were here? That is a hard question! 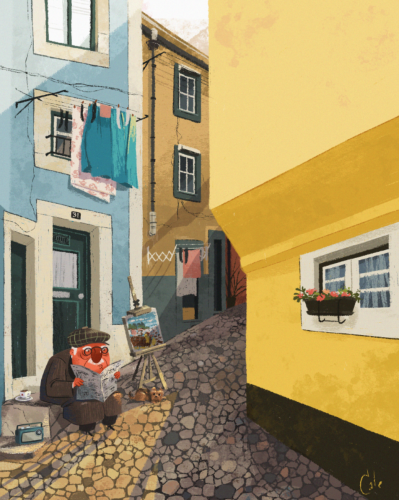 I loved exploring the Alfama side streets while on an early-morning walk, and after purchasing a tasty treat from Saga to accompany me. I cannot stop telling anyone and everyone I meet how they must go visit Sintra. It’s truly a magical area and we made our way there three separate days to take it in. Another routine we began was settling up shop sketching at Copenhagen Coffee Lab when the Thieves Market was happening. We sketched the various people walking by. We may have sketched you! Any story in particular about Lisbon that you’d like me to tell? I can’t recall too many wild stories. We did wake up one morning with large plumes of smoke going by our window. Upon looking out, we saw a building down the street in full flame. Luckily no one was hurt and the fire department got there swiftly. It certainly got us up and awake! Where can people find your work? Can we buy or commission it? I currently have six picture books which I have written and illustrated (as well as others I just did the artwork for). These can be found and ordered wherever books are sold. I also sell artwork on my Etsy store when available, and I may be ordering some prints to sell of my Portugal pieces soon. I always update on Twitter, Instagram, and of course, my website.